Before we start this Pelican soft cooler review, let’s take a moment to appreciate the fact that Pelican have been around for a long time. They were established in 1976, but it honestly feels like they’ve always been there. I feel like, if I hopped into a time machine and made my way back to the Roman Empire’s peak, I’d find pelican basins in the public baths. Okay, maybe that was a bit of an exaggeration, but you catch my drift! One of the things we love about Pelican is that they’re not just a coolers company. They have a wide range of products designed to offer durability and protection in the harshest of environments. From their cases and backpacks to their phone covers, these guys know what they’re doing. People buy their products and use them in all kinds of industries, including law enforcement, aerospace, military/defense, fire/safety, and even simple consumer applications. Their tagline says it all: Built to protect. 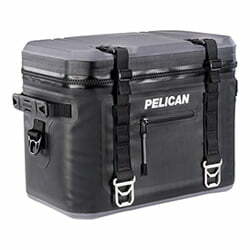 We’ve written about Pelican coolers before (even twice! ), and we loved them. We were having a look at their hard coolers and comparing them to Yeti’s offerings. They did well at a bit lower price point, and we recommended them. Today, we’re looking at their soft coolers and, if we can get slightly ahead of ourselves here, we already like what we see! So here’s a great review of a great brand. Enjoy! 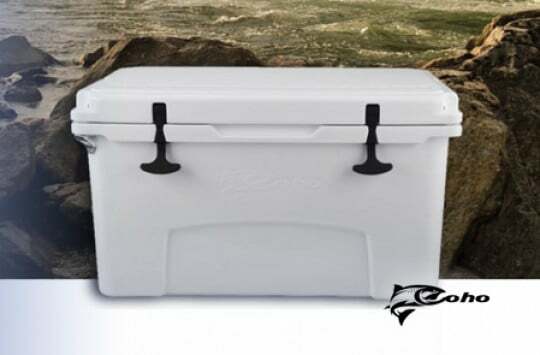 18.00" x 11.00" x 11.25"
Pelican soft coolers have all the makings of a classic soft cooler. No expense was spared in making this product as impenetrable to water and warmth as possible. Let’s start with the exterior. We have double coated 840D TPU, which covers the entire exterior. 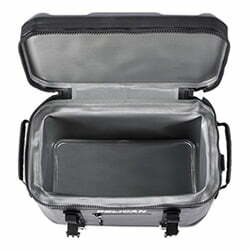 The soft cooler itself has a firm build that ensures it can handle any kind of shock without harming the contents. A firm base ensures that it sits upright, and the numerous cords allow you to tie it anywhere. Whether it’s a kayak, a canoe, an ATV/UTV, or your back! Another thing we noticed about the Pelican soft sided cooler is how light they are. Whether we’re dealing with the 13 quart (SC12), 25 quart (SC24), or 50 quart (SC48), we really didn’t feel the heft. We tried to compare the weight to that of hard coolers and found the Pelican to be up to 55% lighter. This is a massive advantage, especially when the soft cooler is tied to your back. Now, that doesn’t mean these things aren’t hardy. I certainly wouldn’t want one hurled in my general direction. However, I wouldn’t mind carrying one. It’s thoroughly enjoyable. It’s worth to mention that all Pelican Coolers are also made in the USA. These things are capable of retaining ice for days, but let’s look at why this is so. The interior is very tastefully designed, allowing the soft cooler to hold your food and drinks at their initial temperature for extended periods of time. As usual, the inside consists of high density closed cell foam insulation. This is part of what makes the cooler so much lighter than a hard cooler. Consider the 50-quart Pelican soft-sided cooler (the SC48) which empty weighs 8 lbs, and compare it to the Pelican Elite 50 Quart – the hard cooler equivalent at 26.39 lbs. And now, if you don’t have to keep your ice for a week, then you basically have the same same thing, only much lighter and way sleeker. Now here is the interesting part. We had a lot of fun testing out the ice retention of these beasts. Pelican list the ice retention of their coolers at 24 hours. Did you hear that? 24 hours. That’s pretty standard for a soft cooler, anyway, so no one’s faulting Pelican for the spec. However, we put some ice in the SC24 and put it in our garage on Friday night, then waited out. You won’t believe how long the ice lasted. We checked on Saturday, and the ice was still there. We checked on Sunday, and the ice was still there. It hadn’t as much as produced a drop of sweat. We checked on Monday and, sure as Monday is to come, most ice was still there! It melted on Tuesday! Would you believe that? The ice retention went for 3 days, 2 days past the manufacturer’s recommendation, and would have probably extended longer because the ice hadn’t even melted much! 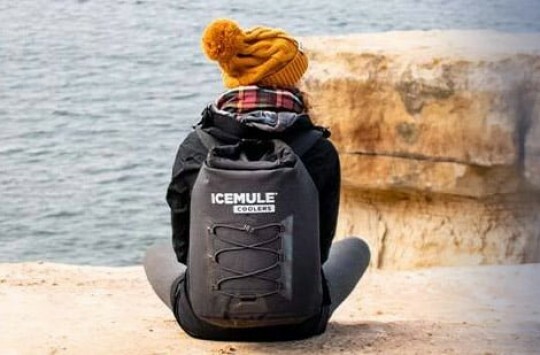 Of course, there are soft coolers out there that can keep your ice for longer, but we’re going to rate the pelican soft cooler an excellent 5, just for their modesty. Who underestimates their own performance by well over a 50% ? The Pelican Elite Soft Cooler is choke full of features. To start with, there are the latches. I saw so many my head swam. What were all these latches for? And then I remembered that these soft coolers are used by all an sundry. The hunter, the fisherman, the kayaking enthusiast, the hiker, and the casual beachgoer, all use Pelican’s soft coolers. And then, of course, there are people like me, who just want to carry their groceries home in a cool bag. You might want to tie your Pelican to your truck, your back, canoe, and even bike/UTV/ATV. Pelican had so much foresight that they added everything necessary. You’ll also love the fact that Pelican added bottle openers to the stainless steel tie downs. Okay, that’s putting the cart before the horse. 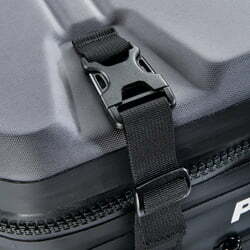 Let’s try another take: you’ll love the fact that Pelican added stainless steel tie downs! 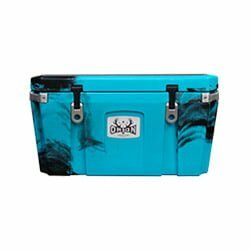 These enable you to anchor your soft cooler in your vehicle so it doesn’t slosh around. Now, what you’ll love more is the fact that they also incorporated bottle openers into these tie downs so you don’t need to look for a bottle opener when you’re enjoying your drinks. See? Pelican are always thinking about us! There is a useful zippered pocket on the front of the soft cooler where you can put your phone and car keys. Handles live on both sides of the soft cooler, making for easy carrying, and a shoulder strap makes it easy to carry the soft cooler for long distances. 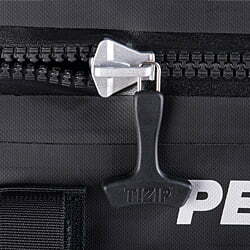 While we’re talking about zippered pockets, let’s take a moment to appreciate the zipper on the Pelican. This isn’t exactly a feature, but it makes everything else so wonderful, and it is the Pelican’s special touch. 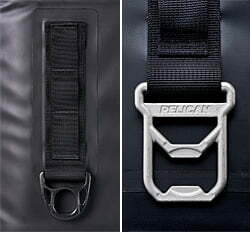 The Zipper on the Pelican is 100% leak proof. We actually tested this and found the claim to be true. We’ve put it on its side, upside down, and even rolled it down the hill full nothing but water. Not a drop saw the outside. On top of that, it has a dual lock buckle system that keeps everything firmly secure. For that, we give this soft cooler 5 for its features. Yep, they’re that good! Everything is also made of high-quality materials, which is all we can expect from Pelican. For that reason, we’ll throw in a 5 for quality as well! 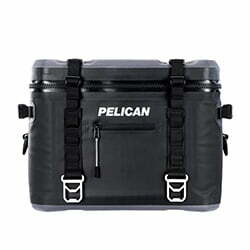 and the Pelican Soft SC48 which is 50-quart soft cooler and comes with the capacity of about 48 cans. 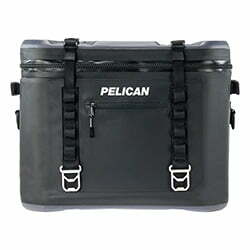 The Pelican line of soft coolers comes in a standard mixture of black and grey. Nothing unusual here. Pelican offer a 3-year warranty on their line of soft coolers. This one was a clash of the titans. Yeti and Pelican are both premium brands, with many comparable features and ice retention times that rival each other. It was pretty difficult for us to choose. Here are some of the things we looked at. Both cooler scored really well on this one. Both employ the best foam insulation technology. They are both sturdy and made from the highest quality materials. On this one, we saw a clear tie between the brands. This one was also a tie as both are choke full of features. Yeti are well known for loading their products with nothing but the best features. Pelican also go out of their way to foresee all possible use cases and build features to anticipate them. This was another tie. Here Yeti are slightly ahead due to their range of available colors and sizes (Hopper Flip, Hopper Backpack and Hopper Two at sizes from 8 up to 40), as well as the extreme customizability of their products. Pelican products, while pretty good, don’t lend themselves as readily to customization. Both are pricey brands. In fact, we don’t think you’re going to get any bargain out of either if all you’re looking at is the price. This is one of the reasons why we rated the pelican a 4 on price. This is a clear tie. 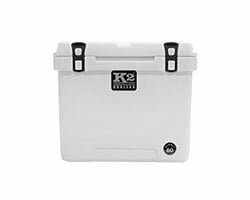 Both are top-of-the-range premium brands, and the coolers are full of features. 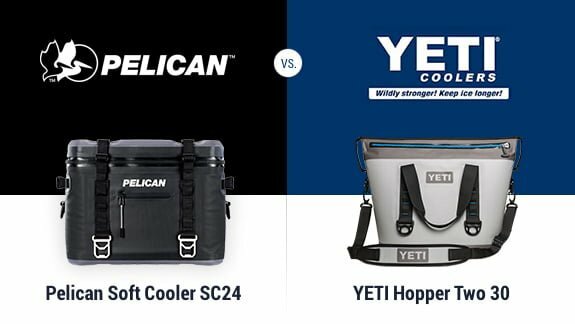 Yeti is a well-known brand that has grown into an industry leader, but the same can be said of Pelican, whose products can easily rival Yeti’s. What we would say that both are clear winners in this case. Unless you’re a die-hard fan of one, you should just check the price of comparable models and buy whichever gives you more bang for your buck! 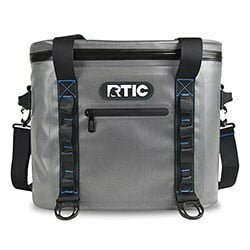 RTIC’s line of soft coolers is pretty good and comes at a lower price point, compared to Pelican or Yeti. The exterior might be a little lower quality, being made out of nylon, but it’s still pretty good and waterproof. 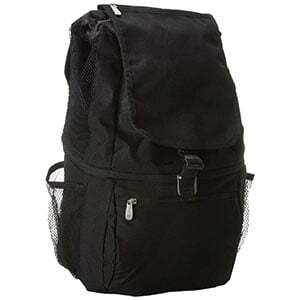 The zipper is waterproof, and the coolers itself is highly durable. You’ll love the ice retention time on this line of soft coolers as well. RTIC report it as up to 5 days. We did some tests in a previous review and found the ice still intact after 3 days, so we think their claim is very likely to be valid. The RTIC comes in available sizes of 8 quarts, 20 quarts, 30 quarts, and 40 quarts and that may give you more choose options. 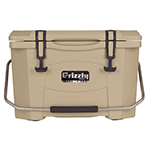 Check RTIC soft cooler prices on Amazon here. 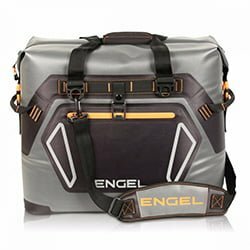 The Engel HD30 is a great alternative to Pelican coolers with some interesting innovations. For starters, Engel coolers are welded while their counterparts are sewn. This dramatically helps to keep the cool air in and the warm air out. The exterior is coated with TPU film, the cooler itself has closed cell foam insulation and ice retention of 4-5 days, according to Engel. 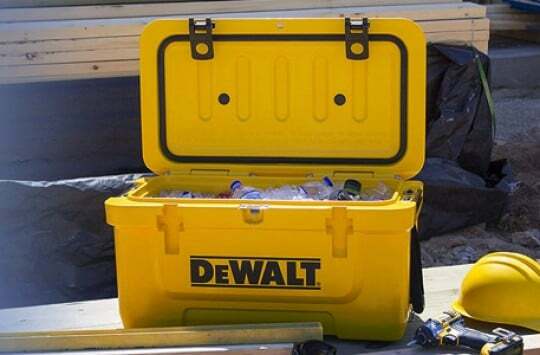 It also offers the option of either carrying the cooler with the tote handles or with the padded strap. All in all, it’s a great cooler! Check it price on Amazon. If you’re on a budget, it’s wise to go with either RTIC SoftPak cooler or Engel HD30. However, if your budget permits, we insist you go with a premium brand like Pelican, a brand that’s offers 100% made in USA products. 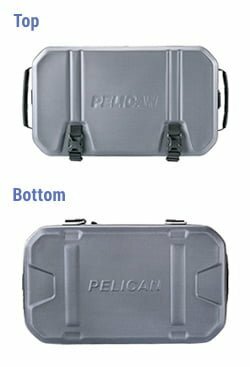 Where To Buy Pelican Soft Cooler Bag? 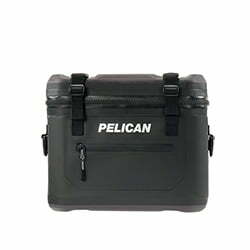 There are plenty of places to buy Pelican soft coolers both online and offline, including their website. However, we recommend you buy your soft cooler on Amazon. There are quite a number of advantages to purchasing your Pelican soft cooler on Amazon. You get free shipping in some cases, especially when you’re a prime member. Pelican are well known for making premium products, and they didn’t disappoint this time. With their line of soft coolers, they’ve brought us a product that doesn’t just do the job; it becomes the owner’s companion for life.